I'm using this page as a developer's diary for the Hal Spacejock PC game. There's just one person working on this thing, and I've never written a game before. (Masses of experience in accounting software and so on, but games? Not so much.) Anyway, I wanted somewhere to post daily updates (newest first), and this is it. And the updates are slowing down ;-) I took three days off to write an accounting program from scratch (done! ), and I'm also working on code for clients. My 3D Math Primer book just arrived in the mail, so that'll be useful, and I spent a few hours designing an interior level. My plan is to allow players to walk around inside buildings, and there may be some combat involved too. Ahh, the joys of programming. In my code I have building objects (based on the same class as planets and stars) and vehicle objects (which share the same class as robots and scenery items.) Despite the vehicles moving around and buildings remaining static, a persistant bug has had me tearing my hair out trying to get buildings to display on the correct terrain tile - and then stay there. Vehicles are well-behaved, doing exactly what you'd expect. 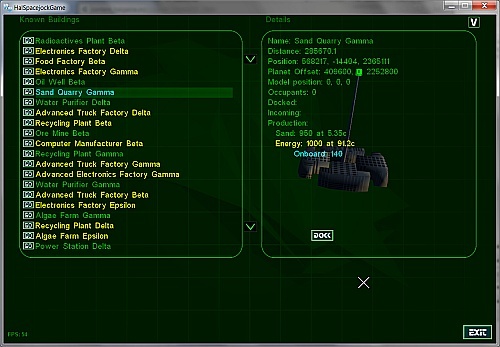 Today I decided to base the buildings on the vehicle class, only with a variable 'CanMove' set to false. (One benefit is that it really simplifies the autopilot, factory production and trading code.) I spent all day moving across building-related variables and changing the entire codebase to handle this alteration, and I finally got it done. When I finished, the damn vehicles were acting up just like the buildings used to. Jumping all over the map, not showing their models ... argghh. Not much programming - it's all math and calculations and future plans for the game at the moment. I'm also working on the issue of wrapping, where a vehicle has to find the shortest path to a destination even if that means crossing a map boundary to get there. 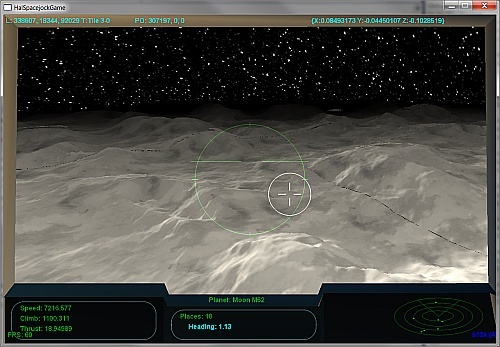 Just started work on the space travel aspect of the game. Now, as someone famously said, 'Space is Big'. Many gamers (few of them famous) have also declared that 'Space is Boring'. The point about Space is that you can fly for hours (days) at mind-bending speeds while not getting anywhere or seeing anything remotely interesting. You can see why most space games force you to jump into and out of star systems. The other problem is that you want to fly between planets within the same system in a reasonable time (10-20 seconds would be good) but you also want to approach other ships. These two are incompatible unless you use an Elite-style booster which drops you back to normal speed when you're in range of something interesting. I figure a structure containing 10k x 10k x 10k cubes will be sufficient for a star and the orbiting planets, assuming each cube is 1 million miles across. Obviously it's not going to be possible to create a data structure that size (1 trillion vectors would require 12 trillion bytes or approx 1 terabyte of ram), but I can get around that by giving each object a location (e.g. 5000,5000,5000 for the star in the middle) and then calculating their relative locations on the fly. Our own sun would would fit neatly into one of those trillion cubes, but Rigel would swallow 50x50x50 while Antares would eat up 700x700x700. The Earth and moon together would take up a cube (actually, half if you calculate the radius of the moon's orbit), but bigger planets with moons orbiting further out would spread across several. If it takes 20 seconds to fly between two planets (never mind their relative positions just yet), then how long would it take to cross the system from one side of the outermost planet's orbit to the other? Hours of game time. So, we need another boost level for that, where planets and moons flash past in the blink of an eye. And what about flying between stars? This is where it gets interesting. I'm going to allow about 5 light years between stars on average. One light year is around 6 trillion miles, or 600 of my structures above laid end to end (each of those containing 1 trillion cubes.) No wonder most games have jump gates. Still, forging on... Let's say it should take 5 minutes to travel 5 light years, which isn't too bad. Moving at one light year per minute means crossing 600 cube structures in that time, which is 100,000 cubes or the equivalent of ten solar systems every second. That means it would take one hundredth of a second to fly from the Sun to the Earth, and five one-hundredths to reach Jupiter. Good luck shooting at passing ships. Obviously you'd want to lock this super-boost drive until the player has left the immediate area around the star, where the planets and moons are. I imagine a light tree where red means you can fly at local speed (approach other ships, dock with things, etc), yellow means you can zip around between planets and green means you can hit the triple-decker boosters and head for the stars. There's a missing step in there somewhere, because if moving from the Earth to Jupiter took ten seconds, flying from the Earth to the Moon would be impossibly fast. The other problem is, if the player is sitting next to the Earth but wants to fly to a star ten light years away, first they have to use slow speed to get away from the Earth, then they have to use Medium to reach the edge of the Solar System, and at last they can engage top speed. Instead, top speed really needs to be scaled depending on the distance to target. (Finally, something practical I can use in my code!) If the player selects a star ten light years away they should be able to travel at super-speed right away, bypassing the slower steps. If they select a ship on the other side of the Solar System, they should be able to travel at a speed which enables them to reach it in 10-20 seconds as well. And if they select the Moon while orbiting Earth, another speed is selected. It's beginning to sound a lot like a Jump drive, although I want to avoid that particular artifact and give the player more control over their movements. So, that's the current thinking. I'm not introducing any of this before the first alpha release, but I need to know where the game is heading. I've been flat out improving the AI these past couple of days. I have to say, this game is turning into more of an ecomony simulator than a shoot-em-up: I can spend ages watching ships and trucks picking the best trades and heading off to buy/sell goods, and it's rewarding when a factory has enough raw materials to fire up production. The only down-side is that the AI is getting so smart there's not much of a need for a human player ;-) I'll balance this by making different grades of AI available (for a price), so the starting AI needs more assistance. Anyway, thanks to the production tree it's important to get the basics like energy and raw materials under way first, so that more advanced factories (fibre optics, electronics, etc) can build the parts which the high-end manufacturers need to make flyers, trucks and robots. I have a few more bugs to sort out before I get to the alpha release, but it's getting closer. Speaking of philosophies ... when it comes to computer games, I agree with the Comte de Frou Frou (Nob and Nobility, Blackadder the Third). To whit, I want others to do the work and give me all the money. Or to put it another way, one does not buy a computer and then add binary numbers by hand. I'll tell you something else which is quite cool - factories have masts with a light on top. The light is green if they're producing, orange if they need raw materials and red if production is halted. (The latter for player factories.) Finding enough products to switch a factory over to 'green' is actually quite fun, especially some of the more advanced factories with longer lists of demands. Once I have the orders system in place I'll be going over everything with a couple of bug-hunters (my daughters), and when they can play it without breaking anything I might release a first Alpha-test version. Today: tackling a bug in the height map. 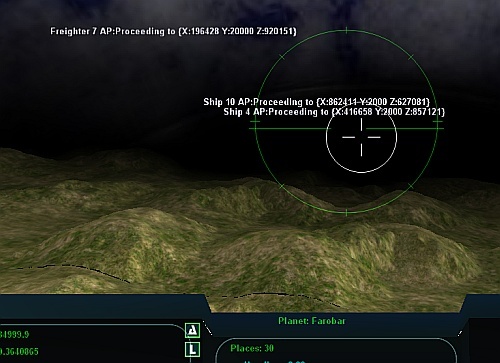 There's a bug where what you see on the screen is not where the computer thinks it is, which allows ships to fly through some hills and hit others where there's supposed to be a valley. One of the problems with programming is trying to turn streams of figures into something tangible. So, I wrote a quick routine which prints a '.' on the screen for all nearby vertices on the heightmap. 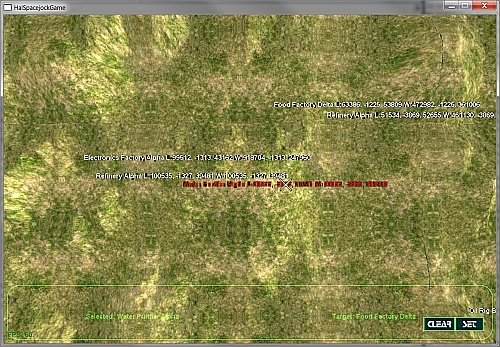 As you can see, the red debugging overlay is nothing like the rolling hills. 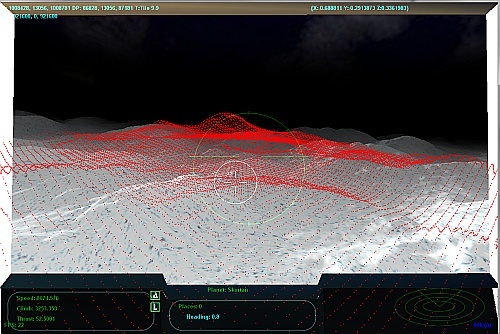 The red dots represent the unseen terrain which the game uses to work out whether you've hit the ground or not. My job is to get them both to line up. Fixed the unsightly seams between landscape tiles, and stomped a bug in the tile wrapping code. Added basic collision detection for buildings and vehicles. Still filling my 320-page exercise book with cool ideas for this game, and I have another five blank books waiting. 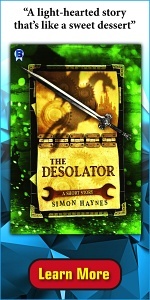 Fortunately, unlike a novel, you can release games early and improve them as you go along. Update: Figured the gunfire out! Now to add collision detection for shots, so you can blow stuff up. Spent a couple of days on freelance programming work. Today was a bug fix day. When you write software you introduce new errors and glitches at every turn, and eventually you have to stop adding new features and spend time time fixing up what you already have. (Unless you're a big company, of course, in which case these fixes become 'features' for version 2.0). 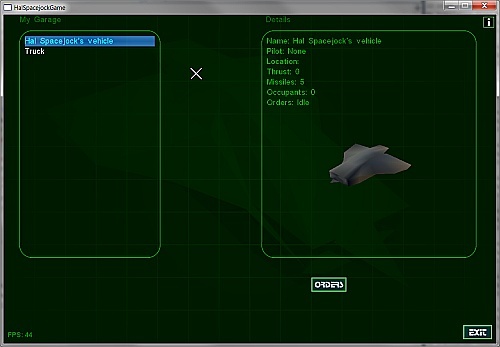 After stomping a ton of bugs I improved the interface screen where you can interact with vehicles. You can now pick any vehicle and issue 'follow' or 'go to' orders, selecting the relevant vehicle or building from a list. I also had to write a combo box control (drop-down list), which I'm going to need for more complicated orders, such as 'buy this product here and sell it over there'. 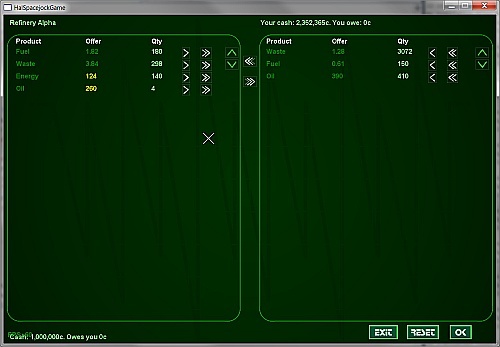 Spent most of the day writing a tool which configures the economy in the game. E.g. I can add factories, assign each to a 3d model file, and specify which products they make (and how quickly). Under the products tab I can define new products and specify the raw materials which go into each one. It's been a challenge putting it all together, but it's now a breeze for me to edit the Spacejock economy. Instead of hand-editing spreadsheet files with lists of obscure ID codes and rows of hard-to-decipher numbers, I can select values from dropdowns and enter numbers into the relevant cells. Last night I played an early Alpha and managed to amass 3 million credits in about five minutes, which is enough to make X-universe addicts weep. I also managed to buy and load 64 T-7 Trucks, which is quite an accomplishment since each one weighs half as much as my flyer. This new tool will allow me to fine-tune such minor inconsistencies. Last night I ripped into the coordinates system (again), and this morning I think I finally fixed it. Buildings still aren't displaying in the right place (again), but that's just an offset problem. I spent the rest of the day working on the user interface - I wrote a listbox class which will be very useful in a game like this, and I also added a few more industries and played around with the economy code. This evening I put together a basic 'garage' screen where players will be able to manage all their vehicles. Ordering your minions around is going to be a big part of the game, and it's something which is very hard to get right. You want to be flexible, but you don't want excessive micro-management either. After a couple of days working on the factory production and economy code I tossed aside my calculator and spreadsheet and took up surveying. I knocked up a quick map screen with an overhead view of the planet - you can scroll around and zoom in and out with the mouse. 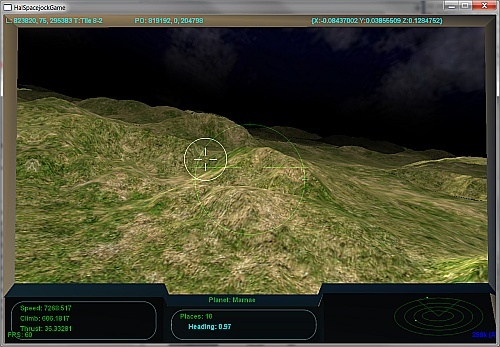 The idea is that players will be able to select buildings and fire up the autopilot, leaving all that flying and driving nonsense to the computer. Assuming your vehicle has an autopilot, that is. On the economy side of things, players can now buy and sell products. When you land at a factory the range of products and the prices depend on what the factory makes and how much raw material is available. 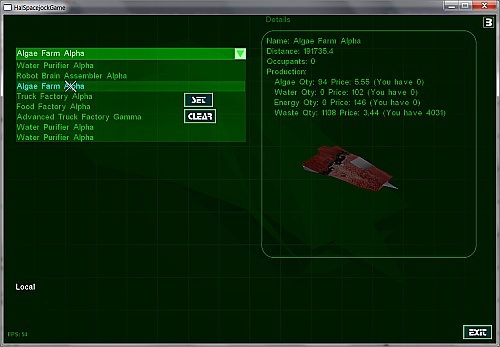 Unlike some space-trading games you can buy raw materials from factories, but they're priced much higher than usual. On the subject of gameplay, I want to make the game playable as a hands-on 3d experience OR a management sim ... or both. Continued work on the AI. It's amazing to start the game up with randomly generated traffic, allocate DockAt, FlyTo and Follow commands automatically, and watch them scurry around like ants. Tried running the game with 300 vehicles on the screen - no problem. Tried 3000 ships and trucks - just for a laugh - and got a slideshow. 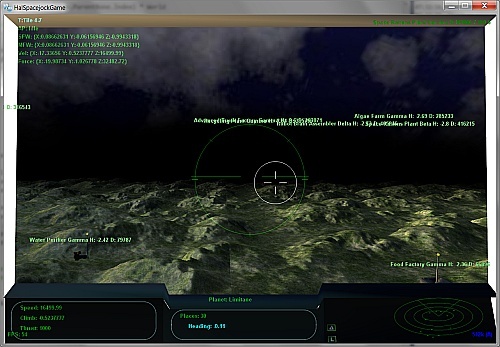 I've added a radar with target stalks, which updates as you fly around the landscape. When you're in range of a building the Land icon flashes - press L to land automatically (just warps there at the moment), and then the trading screen opens. The Hal Spacejock PC game is under development! Like the books, the game will be set in a populated galaxy with plenty of star systems, worlds and settlements. Features will include exploration both in space and on the surface of any planets or moons you might find, buying and piloting assorted vehicles, trading in resources, setting up factories, hiring robots to do the hard work and gaining reputation and cash by helping people out. All that empire-building, and not a crafting table to be seen! Of course, you're not the only person trying to make a buck, and you can be sure the road to the top will be paved with caltrops.